Bischoff, David, Brown, Rich, and Richardson, Linda. A Personal Demon. A collection of stories about a "good" demon and the sorcerer who inadvertently summoned her. Includes a good picture of a more typical demon serving the Word of Drugs. Brust, Steven. To Reign in Hell. Another view of the Fall, with a sympathetic treatment of the Fallen. Invaluable for anyone running In Nomine with the demons as good guys. Davidson, Gustav. A Dictionary of Angels: Including the Fallen Angels. For the traditionalist, this book holds more information on historical "angelology" than any other single source we found. It contains not only listings for every angelic or demonic name mentioned in most religious (and many secular) texts, but also a useful collection of angels and their Words. Curious as to who the angel of Abortion is? Check out the Dictionary. DeVos, Elisabeth. The Seraphim Rising. Near-future science-fiction, with corporeal, telepathic angels who may or may not be aliens – and the Earthly religion that arises around them. Notable mostly for the polarization of religion, such as might well occur with an open In Nomine War. Donnelly, Marcos. Prophets for the End of Time. Will the world end or won't it? Two human prophets and a comedienne set the stage for the End of Time. Features an absent God, a good-old-boy Michael, an Eli-like Gabriel, and a very devious and acerbic Raphael. Duane, Diane. The Book of Night with Moon. Sentient mage-cats and multiple worlds, but some nice tips for proper protocol when addressing the "Eldest, Fairest, and Fallen." Also some philosophical points about temptation and redemption. Freisner, Esther. Here Be Demons. This book, and its sequels, view the War (mostly) from the lighter side, but still have plenty of substance. Gaiman, Neil. Angels and Visitations. The most interesting piece in this collection of short stories is "Murder Mysteries," where the angel of Vengeance is commanded by Lucifer, pre-Fall, to piece together the mystery of the universe's first murder. It also contains excellent insights into the mind of a Word-bound celestial. Gaiman, Neil. Neverwhere. The Angel Islington is a central character in this odd tale; the whole has a very similar feel to In Nomine, if a bit on the weird side. Gaiman, Neil and Pratchett, Terry. Good Omens. An angel and a demon who have known each other since time immemorial conspire against both Heaven and Hell to stop an early Apocalypse. A perfect example of how to run a darkly-humorous In Nomine game, and an important influence on our perspective of relations between the divine and infernal. Huff, Tanya. Gate of Darkness, Circle of Light. 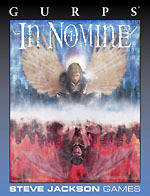 New Age angels and magic, but the motivations of the angel and the humans helping him are worth looking at; could describe any small group of new-recruited Soldiers and an angel trying to deal with a demon on their own. The demon is really nasty. Laird, R.F. The Boomer Bible. Worthwhile if only for its "Book of Angels," The Boomer Bible tells the epic saga of the history of the world as though written by a group of punks in the late '70s, in perfect biblical prose. This book has something to offend everyone. L'Engle, Madeline. A Wrinkle In Time. Another modern classic with a cool perspective on angels. Don't miss its sequels, especially Many Waters. Lewis, C.S. Out of the Silent Planet. This book and its sequels, Perelandra and That Hideous Strength, combine religion with science fiction. 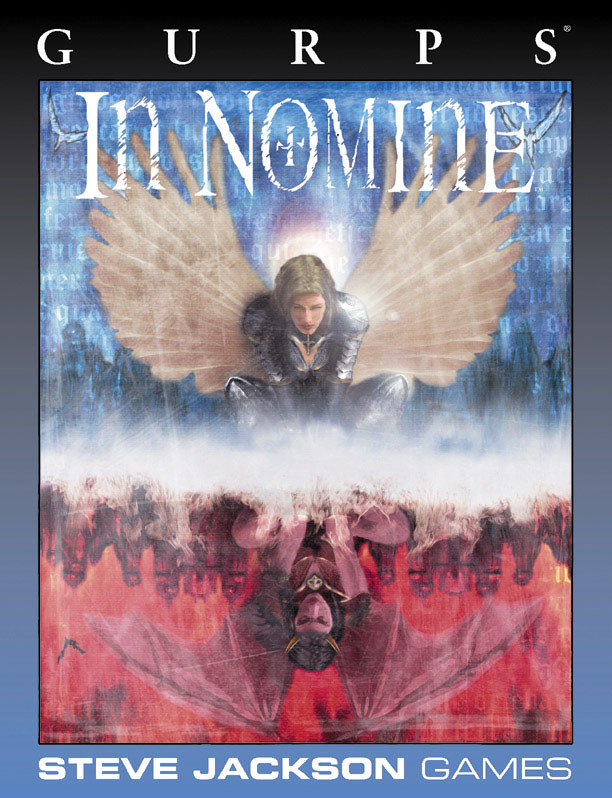 Some of the descriptions of human perceptions of angelic beings parallel In Nomine's celestial forms. Lewis, C.S. The Screwtape Letters. Arguably the best presentation of the diabolical perspective, this is a series of letters in which an older demon advises his young nephew, newly assigned to Earth. Lisle, Holly. Sympathy for the Devil. The War brought out into the open. There are also two sequels, The Devil and Dan Cooley and Hell on High. The first and third books are the best, but all are interesting. MacDonald, George. Lilith. Despite flaws (such as an extreme lack of screen time for the "love interest" of the piece), this book has some interesting things to say about selfishness. Don't show it to the Princess of Freedom, though. Milton. Paradise Lost. Another classic. Criticized by contemporaries for making the damned more interesting than the divine, this is a romantic telling of the Fall of the rebel angels. Don't get the Cliff's Notes – put aside a weekend and work through the original. It's worth it. Niven, Larry and Pournelle, Jerry. Inferno. A modern rewrite of Dante's classic. The sequel, Escape From Hell, is also worthwhile. Peretti, Frank. This Present Darkness. Angels and demons converge upon a town; mayhem ensues. While a bit preachy (and heavy-handedly anti-New Age), readers are treated to some great bits about how spirits interact with corporeal humanity. Robbins, Tom. Another Roadside Attraction. An ex-martial arts instructor in the early '70s sends postcards back to his hippie friends describing his life after accidentally becoming part of the Catholic secret police. When he finally decides he's had enough of the charade, he makes a discovery in the Vatican's basement that could change the face of organized religion. It's not what it is that you won't believe, it's what he does with it. Shinn, Sharon. Archangel. An interesting treatment of corporeal angels and religion in a science-fiction setting. The later books in the series lean more toward science fantasy. Twain, Mark. Letters From the Earth. So bitingly sarcastic that it couldn't be printed in its original form until more than 50 years after the author's death, these are letters written by the angel Lucifer, during his stay on Earth, describing in detail to the other angels how God has set about ruthlessly torturing humanity. Gaiman, Neil. Season of Mists. While most of DC Comic's Sandman comic-book series has a style that meshes nicely with In Nomine, this particular compilation has a storyline of mythic proportion. Lucifer has quit his job as ruler of Hell, evicted its occupants and given the key to Morpheus, master of the dreamlands and our protagonist. In deciding what to do with that damned key, Morpheus is visited by agents from Heaven, Hell, and everywhere in between. Very few things on this list are more entertaining or romantic. These are all the In Nomine game materials published up to the writing of this book. The Angelic Player's Guide, The Infernal Player's Guide, The Ethereal Player's Guide, and The Corporeal Player's Guide provide deeper insight into how the various Choirs, Bands, and types of humans fit into the Symphony. The Game Master's Guide includes additional background material on the Symphony, including an In Nomine timeline, as well as detailed advice to the GM on designing and running an In Nomine campaign. Liber Reliquarum: The Book of Relics covers the creation of artifacts in more detail, and includes a large number of additional artifacts, talismans, and relics, both common and rare. Liber Canticorum: The Book of Songs greatly expands the number of Songs, including rare and forgotten Songs. Liber Castellorum: The Book of Tethers includes much additional material on the formation of Tethers, typical staff and defenses, and a collection of Tethers from around the world for each major Superior. Liber Servitorum: The Book of Servants adds depth to how Servants (hirelings and Allies) fit into the War. It also includes a sampling of ready-to-use Servitors of all the major Superiors. Liber Umbrarum: The Book of Ghosts expands the rules for ghosts first touched on in the Corporeal Player's Guide, with details on a dozen new types of ghosts, ideas for ghost-centered campaigns, ghosts as player-characters, allowing a slain PC to remain in the game as a ghost, new advantages and disadvantages for dealing with ghosts, etc. You Are Here: Around the World in 666 Days details a number of useful In Nomine locations: corporeal, ethereal, and celestial. The Game Master Pack contains a GM screen (for In Nomine rules) and a 32-page starter adventure, Feast of Blades. The Revelations Cycle is a set of five books: Night Music, The Marches, Heaven and Hell, Fall of the Malakim, and The Final Trumpet. These contain a series of linked adventures, city settings for Austin (Night Music) and Los Angeles (Fall of the Malakim), expanded Superior descriptions, new minor Superiors, and more coverage of the ethereal and celestial realms (The Marches, Heaven and Hell). Superiors I: War and Honor offers complete writeups on the "war faction" among the Archangels: Michael, David, Laurence, and Dominic, their Words, and their Servitors. Superiors II: Pleasures of the Flesh goes into infernal detail about Andrealphus, Haagenti, Kobal and Nybbas, their Words, and their Servitors. Superiors III: Hope and Prophecy covers Gabriel, Blandine, Yves, and Khalid, along with their Words and their Servitors. Superiors IV: Rogues to Riches covers Valefor, Mammon, Fleurity, and Alaemon, along with their Words and their Servitors. Angel Heart. If we told you how this was related to In Nomine – beyond the title, of course – it'd give away the film. Trust us. City of Angels. This is the 1998 U.S. remake of Wings of Desire, below. The City of Lost Children. The In Nomine view: "A dissonant servant of Beleth captures one of Jean's Tethers, to which he brings children to be mined for their dreams." (Well, maybe not.) This French film has gotten very little press in the States, but its inventive imagery makes it an In Nomine must-see. Desperado. Divine mariachis and infernal drug dealers duke it out in a border town in this dark, funny, dark action movie. Also check out From Dusk Till Dawn, a horror movie from the same director. Fallen. Effectively, mortals versus a powerful Shedite. Has a spooky scene where the demon is possessing a new bystander for each sentence of conversation with the protagonist. Hellraiser and Hellbound: Hellraiser II. The first two in this series of films from Clive Barker are worth their decidedly different perspective on Hell and its minions. Highway to Heaven. The first major TV series starring an itinerant angel. Michael Landon's character would make a very low-key Mercurian of the Wind. Michael. While the title character is very different from the Seraph Archangel of War in some ways, he's very similar in others. And the line, "I'm an angel, not a saint" should be on quite a few celestial lips. The Prophecy (aka God's Army). Christopher Walken never looked as cool as he did in this film, playing Gabriel. It's a great film – if only we could've seen more of the celestials and less of the humans. There's also a sequel, The Prophecy II. Touched by an Angel. Two major angelic characters do their jobs helping people, with occasional appearances by the Angel of Death. Sometimes a bit saccharine, sometimes not. Twin Peaks. The presence of a renegade demon – a familiar, grown up into something resembling a Shedite – sets off a struggle of cosmic proportions in the small town of Twin Peaks. This series has a great perspective on the war between good and evil, with excellent characters illustrating a wide range of nobility and pettiness. Wings of Desire. An angel, inspired by his love for a human, struggles over taking corporeal form to be with the object of his desire. If any book or film best romanticizes the Heavenly Host, it's this one.